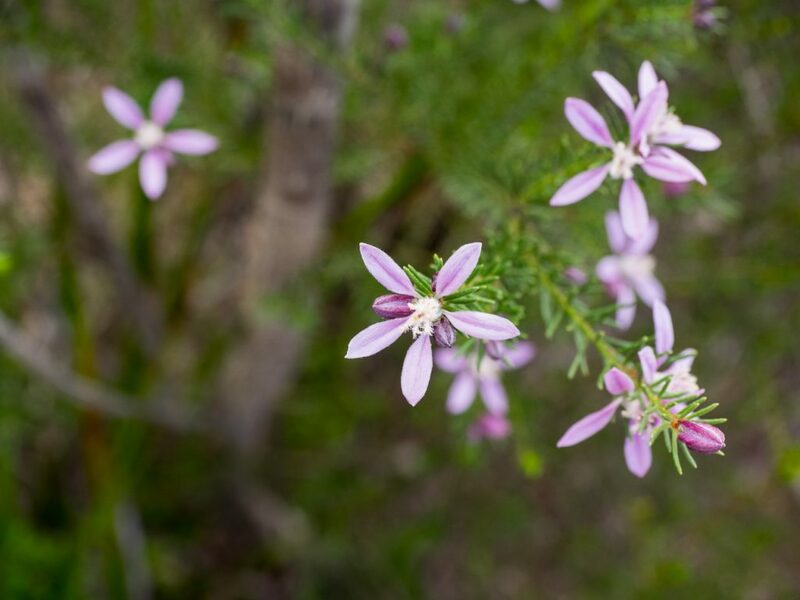 A short walk in the famed Muogamarra Nature Reserve leaves me in thrall to the beauty of flowers and the names used to describe them. Two things happened this week: First, with my partner Jane’s family we finally went on a bushwalk in Sydney’s Muogamarra Nature Reserve. Second, a few days earlier, I started reading Robert MacFarlane’s magnum opus on language and landscape Landmarks. The link between them was a simple act: naming flowers. Looking North to Mt Wondabyne and Brooklyn, Muogamarra Nature Reserve. Wildflowers are what Muogamarra is famous for. 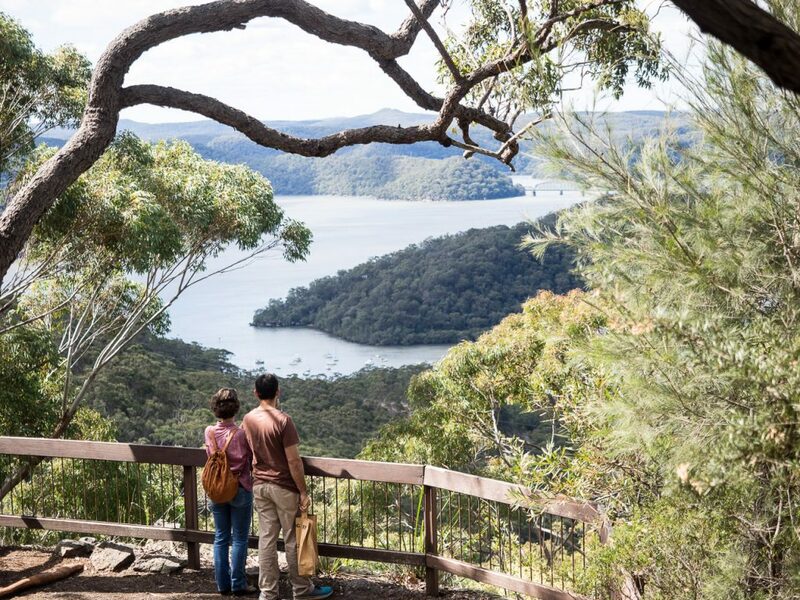 Open only for 6 weeks in early Spring, it is a destination for flower lovers and bushwalkers across Sydney. Within minutes of starting on the child-friendly 4km Lloyd Trig walk, I could see why. Even though we had arrived early in the season, huge pink sprays of Wax flowers (Eriostemon australasius) lined the ridge-top walk. Between them sat smaller and often subtler shrubs: pea flowers such as the huge yellow Gompholobium grandiflorum and duo-tone bossaieas; the star-like boronias. 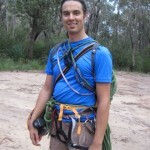 It’s a place I couldn’t recommend highly enough to any plant-lover or bushwalker. Luckily, I was in the company of my mother-in-law, Pip, a botanical expert. She could expertly identify almost all of the species that we passed. I stopped to capture macro photos of them, despite the gusty conditions after the previous day’s cold front. Photographing flowers is an act of worship in itself, but it’s also one that is increasingly facile. Even with the simplest of digital cameras (a smart phone, say) and the most modest of skills it’s possible to document the beauty of a flower in bloom. But this visual admiration is only the first step in truly knowing and loving a place. It is a slice of time that can be easily put on an Instagram feed and divorced from its natural context. 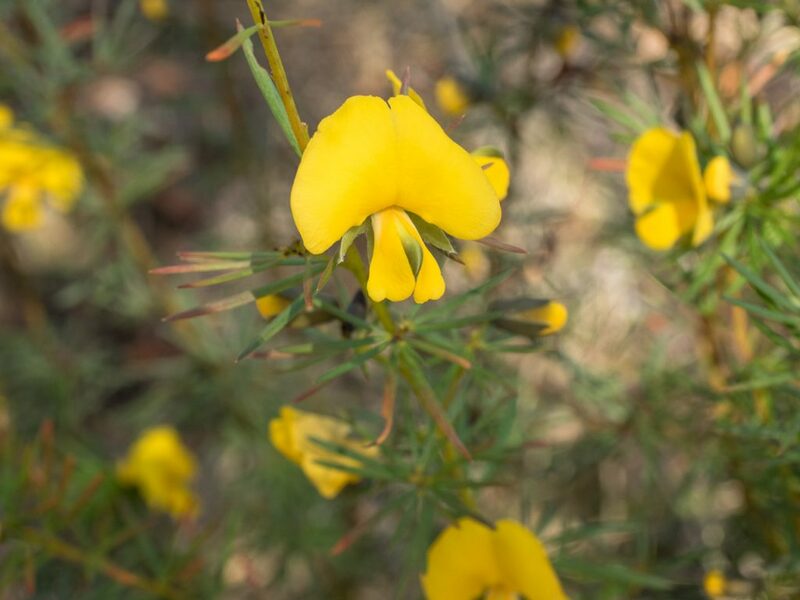 Large Wedge-pea (Gompholobium grandiflorum), a common plant to Sydney and the Blue Mountains but superb nonetheless! You see, the more time I’ve spent walking in the Australian bush the more I’ve become enamoured with identifying the bird and plant species I encounter (and mammals too, but I see far fewer of these). On this day, I took a particular pleasure in wrapping my tongue around the assonant scientific names that Pip happily shared with me as we slowly moved along the trail. 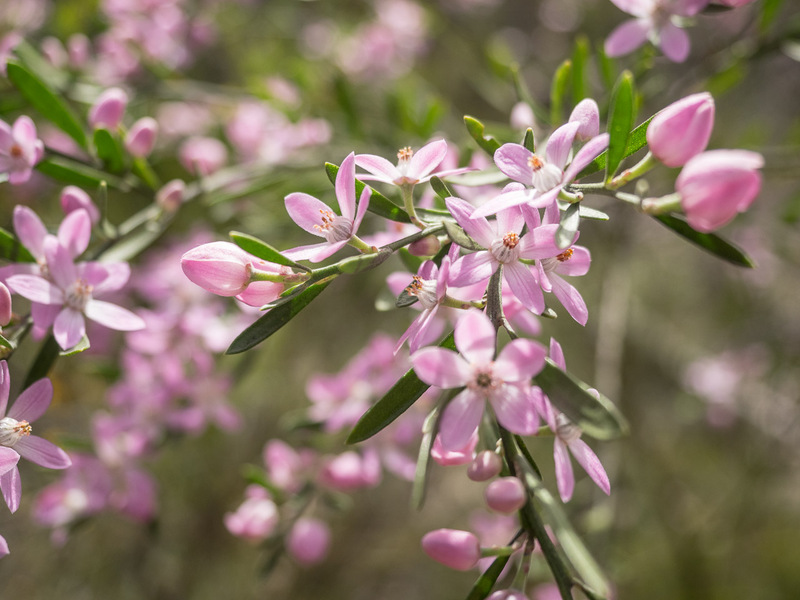 These scientific names are often more lyrical than their common counterparts: compare the rolling vowels of eriostemon to ‘wax flower’, for example. The desire to name things does carry negative connotations. In some instances, it could be the base need to prove that you know more than others. It can also be construed as an act of ownership, the desire to have dominion over a place by virtue of the ability to name or map it. Think of the legends of those who could control demons and Devils by naming them. Less metaphorically, there is the declaration of Australia as Terra Nullius by the English colonisers: a place of no owner and no use that could be claimed in the King’s name. The naming of mountain ranges in tribute to faraway nobles and benefactors. Walking through shadow and light, between sprays of wildflowers, on the Lloyd Trig Walk, Muogamarra Nature Reserve, NSW. Front of mind today, though, was the idea of ‘particularizing language’, which I had just read in Landmarks. It’s a term used by American essayist Wendell Berry to speak about the importance of vocabulary in defending or valuing our wild places: ‘for we love what we particularly know.’ In turn, MacFarlane was quoting him in the context of a protest against a recent decision by Oxford University Press: to remove a whole range of nature vocabulary from its junior dictionary (acorn and fern, for example) in favor of contemporary terms like blog or broadband. It was the displacement of the physical world by the virtual domain at a time when we can ill afford to be disconnected from the natural world that, ultimately, sustains our very existence. It’s still early days for me with Landmarks – a reasonably hefty 350 pages of non-fiction – so I’m only just starting to engage with the substance of MacFarlane’s interest in the site-specific glossaries of place in the British Isles. But it’ already provided me with some illumination into my love of the language of place: to me, naming is not a purely scientific fascination or an act of appropriation. Instead, each new species that I can identify and name becomes an extension of a desire to know and to love the landscapes through which I am walking and the plants and animals that live within them (and which could not survive without). After that you start to notice other things, like the subtle shifts in geology and topology that accompany every ecotone. 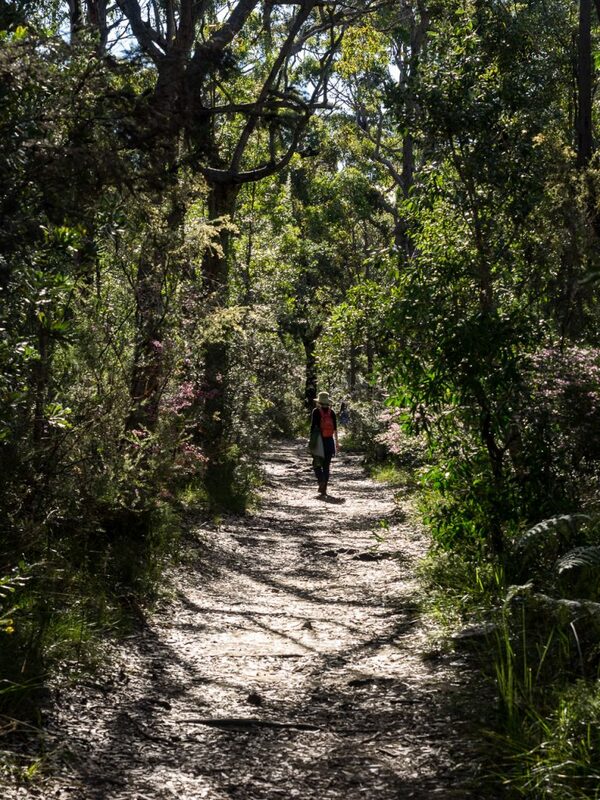 And if you’re interested in walking down that (bush)path, Muogamarra Nature Reserve in Spring is a brilliant place to start. 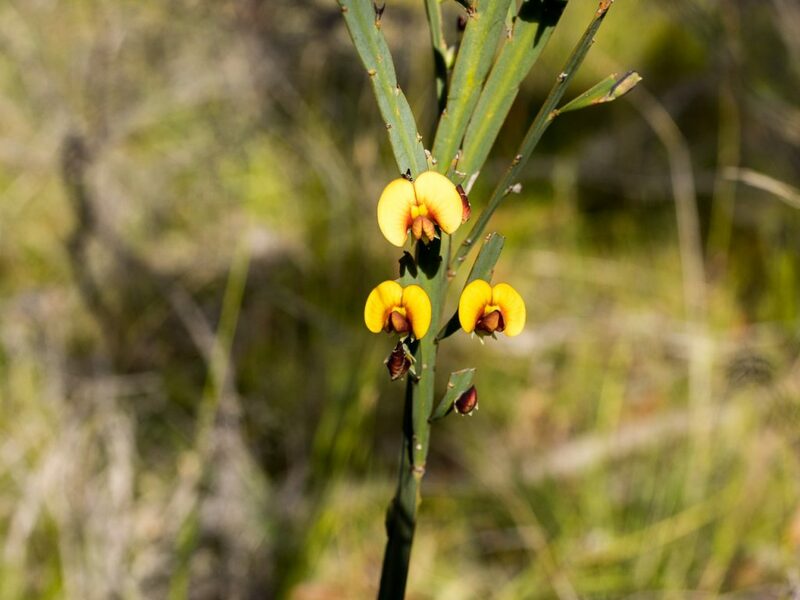 Plank plant (Bossiaea scolopendria), an unusual pea plant that I had not seen before: its flowers grow straight from the stems. Muogamarra Nature Reserve has really wonderful and unique blossoms. Good thing, it is now protected and reserved. I hope more people will come here and appreciate nature’s beauty.